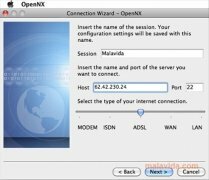 OpenNX is a program that will allow you to carry out remote connections to other computers on which the server program has to be installed. This application is an alternative to the popular NoMachine NX, and uses the same NX technology, thus it will be necessary to have access to the NX server installation. OpenNX is a good open source option to access other computers remotely. Allows the use of various types of proxies. Can improve the speed using libjpeg-turbo. Uses the wxWidgets tools that add interesting functions. Compatible with the NoMachine client because it uses the same technology. Allows you to carry out connections by means of SSH (Secure Shell) through an authentication system based on SmartCard. Allows you to run RDP, VNC and X desktops. With OpenNX you'll be able to complete remote connections very easily and securely and virtualize desktops. Download OpenNX to your Mac for free. Requires that you have X11 installed.